NEWS WiFi free / Recently you can use Point WiFi access free. onora is northern state of Mexico, which is unique for its rich history, natural beauty and diversity. There is a large Sonora Desert, with lovely desert fauna and flora, which contrasts with Sierra Madre Mountains and Sea of Cortez cost. It is home to Indians, a place with unforgettable atmosphere, suggestive music and the typical aroma of Mexican cuisine. 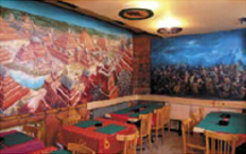 To enjoy at least for a moment the atmosphere and tastes of Mexico, please come to visit us. We offer delicious Mexican cuisine (quesadillas, burritos, flautas, tacos, fajitas and steaks), our specialties and a large selection of tequilas and rums. In addition, we offer holding parties, corporate events, lunch menus, takeaway, tequila and rum tasting.